Identify the introductory paragraph, the concluding paragraph and the topic areas in this report. Then number the paragraphs in the correct order. Sha Tin used to be a small village on the edge of a shallow inlet. Quarter of a century later the town is hardly recognizable, with high rise buildings, large shopping centres and a population of over ½ million people. Today it is not only local people who enjoy the world class racing in Hong Kong. Tourists increasingly add a day’s racing to their holiday itineraries and overseas betting is on the increase. It would seem that from its humble beginnings on that mosquito-infested marshland, horse racing in Hong Kong has grown into a world-renowned pastime that we should all be proud of. However, it took another 47 years before the first permanent stands were built. These were replaced in 1957 and extended in 1969 to form part of today’s stands which can hold over 55,000 race goers. Mention Hong Kong to anyone around the world and they will immediately think of skyscrapers, shopping and horse racing. Hong Kong’s second racecourse opened here in 1978. Today, up to 80,000 punters flock to the seven storey grandstands each time the course opens its gates. In the early seventies, off course betting shops were opened and telephone betting started. Now you didn’t even have to attend race meetings to follow the horses, making racing available to many more people. Nevertheless, a new race course was needed and the Jockey Club was on a lookout for a place in the New Territories. 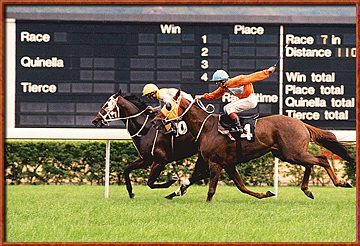 Racing started in Hong Kong in 1846, when the first race meeting was held in Happy Valley, a flat area on Hong Kong Island which had previously been a malarial marshland. Race meetings initially occurred only once a year, at Lunar New Year, but by 1884 the Jockey Club had been founded to organise racing activities on a more professional footing.